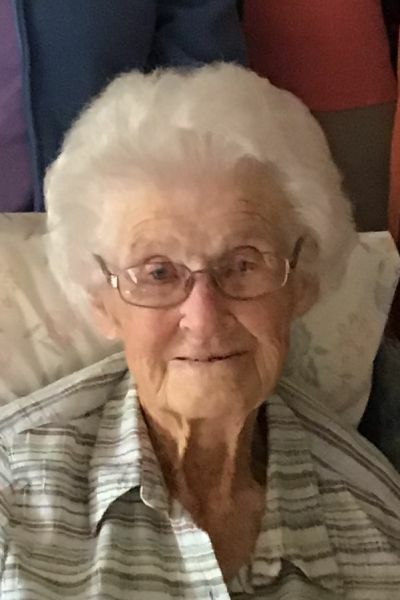 WOODLAND - Elizabeth Cochran, 96, passed away peacefully December 1, 2018 at the Aroostook House of Comfort in Presque Isle. She was born January 5, 1922 in Woodland, the daughter of the late Aquila and Nettie (Steeves) Fowler. Elizabeth married her husband, Mark “Jack” Cochran, in 1944. From 1966 to 1992, Elizabeth worked as a teacher’s aide at Woodland Consolidated School. She served as Deaconess and pianist at the First Baptist Church of Woodland and was most recently a member of the Gray Memorial United Methodist Church in Caribou. She has been an active member of Rebekahs, an Independent Order of Odd Fellows, Sno-Drifters, the Woodland Historical Society and both the Woodland and New Sweden homemakers’ extensions. Her needlepoint pictures have won numerous awards at the Northern Maine Fair. Most recently, in 2017, Elizabeth was the recipient of the Boston Cane from the Woodland Historical Society in honor of being the town’s oldest resident. Elizabeth is survived by her children, a daughter Patricia Anderson of Westmanland and a son Ronald Cochran and his wife Carolyn of Littleton, MA, two brothers and their wives, Dale Fowler and his wife Betty of Browns Summit, NC and Sebring, FL and Russell Fowler and his wife Marguerite of Spring Hill, FL. Three grandchildren; Ronald Cochran of Littleton, MA, Sarah Cochran of Port St. Lucie, FL and Ethan Anderson of Portland. Two great-grandchildren; Julia and Hannah Cochran of Littleton, MA. Elizabeth was predeceased by her husband Mark, her son Mark, a son-in-law Byron “Barney” Anderson, a sister Evelyn Gooding, a brother Elbert Fowler and his wife Idella and a sister-in-law Glenna Fowler. The family would like to thank the Cyr family, Aroostook House of Comfort, Professional Home Nursing, Glenna Jackson and Dr. Krista Burchill and her medical assistant, Kristina, for their special care and comfort of Elizabeth and her family in her final months and days. Friends and family may call on Saturday, December 8 from 11 a.m. at Gray Memorial United Methodist Church, 2 Prospect Street, Caribou, ME, until time of services which will be held 12 noon. In lieu of flowers, the family requests that donations be made in her memory to either the Aroostook House of Comfort, P.O. Box 867, Presque Isle, ME 04769 or the Gray Memorial United Methodist Church, P.O. Box 69, Caribou, ME 04736. Please accept my condolences at the passing of your mother. Mrs. Cochran (I could never call her Elizabeth) worked at Woodland School when I was a student there. After her retirement, I began working at the school. Mrs. Cochran visited the school on many occasions. She always had time to stop for a visit, a quick hug, and a little laugh. She was a wonderful example of a truly kind person, dedicated to her family, community, and church. Pat and Family, Am so sorry for your loss. Your Mom was a kind and sweet lady, and liked by all who knew her. My children have fond memories of her while they were in school, and remember how kind she was to them. They loved her. Please know you're in my thoughts and prayers during this difficult time. My thoughts and prayers go out to the family of Elizabeth Cochran I loved her dearly. I'm so sorry to learn of Elizabeth's passing. She was one of a kind, and I feel privileged to have met her. My sincerest condolences to the family.